The fans of Fringe don’t have to watch the ratings and worry that their show will be cancelled this season. FOX has already announced that the show is ending after 13 episodes. Still, it’s fun to track how well the final episodes and series finale perform. 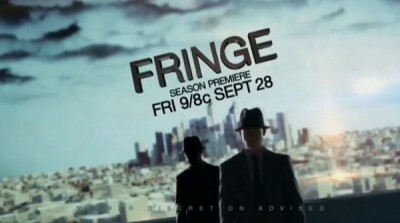 The fifth season of Fringe typically airs Friday nights at 9pm on the FOX network. There are just 13 episodes. The cast includes Anna Torv, Joshua Jackson, John Noble, Blair Brown, Jasika Nicole, and Lance Reddick. Below are the TV show’s ratings for the 2012-13 season, ordinarily the best way to tell if Fringe would be cancelled or renewed for another season. Final season averages: 1.0 rating in the 18-49 demographic with 2.82 million total viewers. 1.0 in the demo (-9% change) with 3.09 million (-9% change). Season averages: 0.97 in the demo with 2.82 million. 1.1 in the demo (+38% change) with 3.28 million (+34% change). Season averages: 0.97 in the demo with 2.80 million. 0.8 in the demo (-20% change) with 2.44 million (-19% change). Season averages: 0.95 in the demo with 2.76 million. 1.0 in the demo (-9% change) with 3.02 million (-3% change). Season averages: 0.97 in the demo with 2.79 million. 1.1 in the demo (+22% change) with 3.12 million (+15% change). Season averages: 0.97 in the demo with 2.76 million. 0.9 in the demo (0% change) with 2.71 million (0% change). Season averages: 0.95 in the demo with 2.72 million. 0.9 in the demo (0% change) with 2.70 million (+9% change). Season averages: 0.96 in the demo with 2.72 million. 0.9 in the demo (0% change) with 2.47 million (-4% change). Season averages: 0.97 in the demo with 2.72 million. 0.9 in the demo (0% change) with 2.58 million (+1% change). Season averages: 0.98 in the demo with 2.77 million. 0.9 in the demo (-10% change) with 2.55 million (-3% change). Season averages: 1.00 in the demo with 2.82 million. 1.0 in the demo (0% change) with 2.64 million (-11% change). Season averages: 1.03 in the demo with 2.91 million. 1.0 in the demo (-9% change) with 2.98 million (-5% change). Season averages: 1.05 in the demo with 3.05 million. 1.1 in the 18-49 demographic with 3.12 million total viewers. Season averages: 1.1 in the demo with 3.12 million. This was the show’s lowest premiere to date and essentially matched a rerun of The X Factor that preceded it. Last season’s premiere attracted a 1.5 in the demo with 3.48 million. Reference point: The 2011-12 (fourth) season averaged a 1.1 rating in the 18-49 demographic and 3.07 million viewers. What do you think? Do you still like the Fringe TV series? Are you upset that there won’t be a sixth season or just happy that it wasn’t abruptly cancelled earlier? Don’t listen to Mar-tine, Mar is in there, look it up. Fringe is the best show ever! Just started watching the show and I am sad that its already cancelled.